The Mausoleum of Mohammed V, which was completed in 1971, contains the tombs of King Mohammed V and his two sons, King Hassan II and Prince Abdallah. 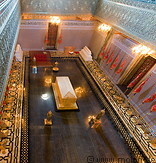 It is located next to the Hassan Tower on the Yacoub al-Mansour esplanade. The building is considered a masterpiece of modern Alaouite dynasty architecture, with its white silhouette, topped by a typical green tiled roof. 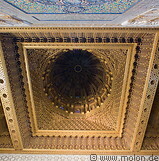 The Mausoleum is richly decorated with elaborate zellij mosaics from floor to ceiling. The Hassan Tower or Tour Hassan is the minaret of an incomplete mosque, whose construction started in 1195 but was never completed.